The Project has recently finished clearing overgrown vegetation from a pond at Jubilee Wood, a Local Nature Reserve, owned by the Royal Borough of Kingston at Malden Rushett. The work was carried out at the request of the Malden Rushett Residents Association and has been jointly funded by the Royal Borough of Kingston and the Trust. There was also support from Chessington World of Adventures who removed all the piles of vegetation that the volunteers pulled out of the pond. Expect to see more activity in this area over the next couple of years. The Trust has now spent all the funds it had raised for Hersham Riverside. The site is owned by Elmbridge Borough Council and the Project became involved in the site when the management of it was handed to the Borough’s Countryside team. Fundraising by the Trust started back in 2007 and received a big boost with a grant of £7,990 from the National Lottery through the Big Lottery Fund and Breathing Places award in 2008. In total £11,049.15 was raised by the Trust, including a donation in memory of Project volunteer Dave Young, who lived in Hersham, from his friends and family. 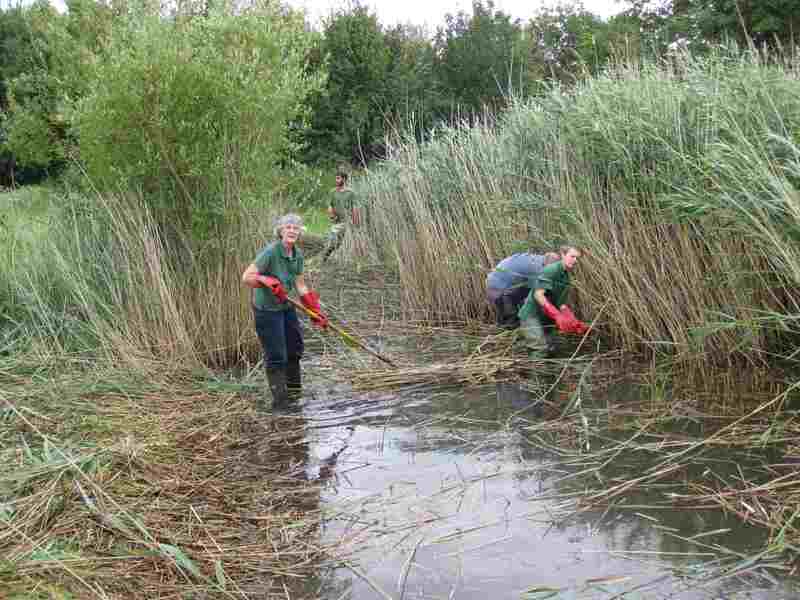 The first work funded by the Trust, was scrub clearance to widen some of the paths, and took place in October 2007. Since then the Project has installed benches, welcome signs and surfaced nearly 400m of path, as well as clearing back overgrown vegetation from paths, opening up views of the river and clearing young tree from the riverside meadows. The meadows are now under regular management by the Countryside team to maintain the riverside landscape of meadows and hedges. The Trust also held two Open Days, one in glorious weather and the other on a wet and windy day, to encourage local people to visit this attractive spot. The work has been supported throughout by the Countryside team and particularly by their excavator driver Ashley, who has been a great help with preparing paths for surfacing and loading materials into dumper trucks. The Trust made a donation to the Friends of Teazle Wood appeal to help raise funds to purchase the wood. Teazle Wood was purchased by the Friends on 31st July, with over £300,000 being raised. They are still fundraising as some of the purchase price was lent and needs to be repaid. They will also need funds to manage the woodland into the future. The Project and Surrey Wildlife Trust are giving management advice. The Trust has now spent all the money raised for Stokes Field, a Local Nature Reserve in Long Ditton. £9,264 was raised for this site, also owned by Elmbridge Borough Council. The Trust agreed to fund raise for this site in 2009 after it was left funds by local resident Liz Thurston, a regular volunteer with the Project for 17 years. 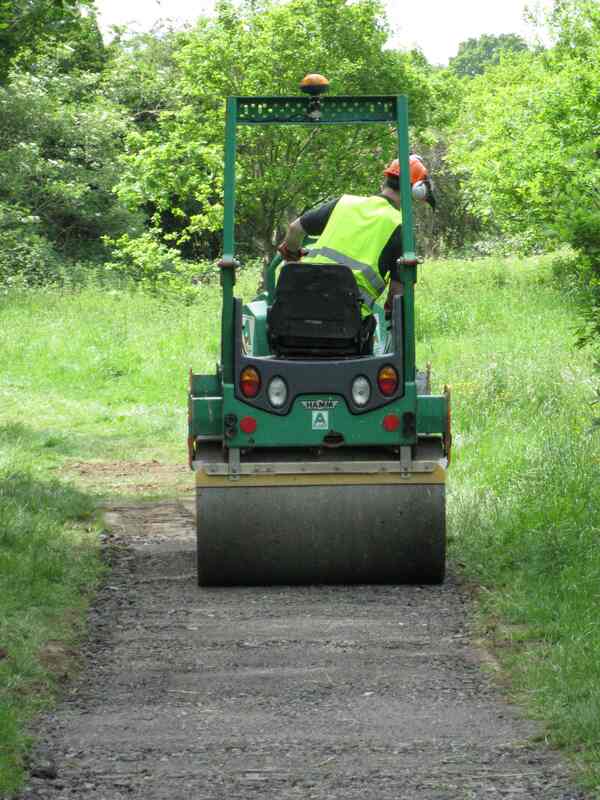 The Trust has funded the creation of glades along the paths through the woodland, scrub clearance from the meadows, benches and welcome signs, plus in conjunction with Elmbridge Borough Council and Long Ditton Village Hall Trust, 300m of path surfacing. The Project also installed a pond-dipping platform funded by the Orchid Environment Trust and Community Foundation for Surrey. The Trust is pleased to announce that David Bellamy has kindly agreed to be a patron. David grew up in Cheam and although he no longer lives locally he has retained an interest in the area, recently attending an event at Nonsuch Park, which was when he was introduced to the Trust.